Quanta has reportedly received orders to build a tablet for Amazon (s amzn) for delivery the second half of this year, with production expectations of up to 800,000 units per month. DigiTimes, which covers the Asian device and component markets, shares the news today, and while it doesn’t shed any light on the hardware details of Amazon’s potential tablet, this development solidifies thoughts that Amazon isn’t going to let the growing tablet market pass by. Given Amazon’s core competencies of cloud, usability and data synchronization, one can imagine what such a tablet will look like. Unless Amazon has secretly designed a superior mobile operating system, it’s a given that any new Amazon tablet will run on Google’s Android (s goog) operating system. The company has already launched its own app store for Android apps, providing a free app daily and an assortment of curated, high-quality titles. And as I’ve already seen with the Barnes & Noble Nook Color (s bks), some of Android’s user interface flaws can be covered up with a smart, custom interface. Amazon may use the stock Android look-and-feel for a tablet, but I wouldn’t be surprised if the device had a cleaner software design, which would make it easier to use while also differentiating it from the slew of other Android tablets. 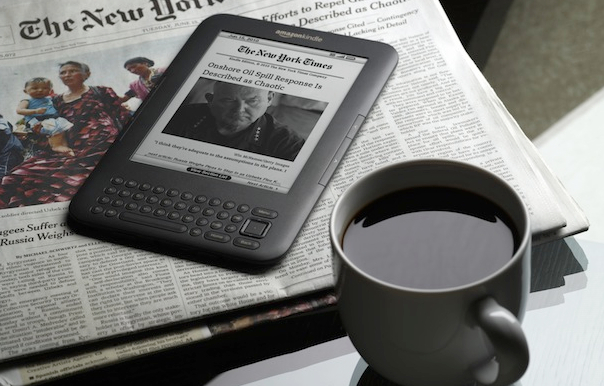 Apps and software design aren’t all that Amazon can offer to the tablet market, however. The company recently upgraded its MP3 software for Android devices to support music streaming over data connections. That means consumers who buy music from Amazon can listen to their songs anywhere using the Cloud Player service. That app integrates nicely with the Cloud Storage service Amazon launched in tandem with its Cloud Player streaming service: Music files can be stored on Amazon’s servers for a low cost. But music is only part of the solution because photos, videos, documents and more can be stored with Amazon. The company could keep the price of its tablet lower than competitors by reducing the amount of flash memory available and bundling 20 GB of Cloud Storage with the purchase of a slate. Smart software could automatically sync photos or documents from the tablet to the cloud and back again as needed, similar to the rumored intelligent music synchronization that HP will bring to webOS tablets. Amazon’s strength is in its cloud and sync services — think “WhisperSync” on the Kindle, for example — so any Amazon tablet is likely to leverage those. Perhaps only Quanta knows what Amazon’s new tablet will physically look like, but if you connect the dots, you can see how such a device might be used and how it might stand out from the crowd. In the second half of 2011, I expect to see a thin Amazon slate, perhaps in a highly portable 7-inch size, that runs an elegant interface atop Android and relies heavily on the cloud. Well, since you write for a site called HPPalmNews, I can see your POV. ;) webOS on the Android tablet is wishful thinking IMO; why would Amazon have invested time, effort and money in Amazon apps for cloud streaming and a separate app store for Android software? I’m not suggesting it’s impossible that Amazon would go with something other than Android, but there’s plenty of evidence that it will. Amazon’s tablet is not going to be positioned as iPad killer, but instead it will try to create its own niche, and I have little doubt that it will be successful in that particular niche. I have details on the hypotehtical niche here http://itvale.com/2011/04/will-amazon-launch-a-tablet.html/. I love Amazon and I have been waiting for this tablet/kindle for a while now. I am lower my expectation and say that it is going to be bad. I am covering all the basis here. If it’s bad than I won’t be upset, but if it’s amazing than I will be elated. I am hoping Jeff Bezos and team prove me wrong. I think Pads are like Pods about integration of services. Now Amazon has an interesting philosophy about services . So far mobile signal integration has been about physical signals,GPS, acceleration … no reason not to integrate “soft” signals going forward. Amazon has the experience and architecture for doing just that. Our technologies are almost exclusively implemented as services: bits of logic that encapsulate the data they operate on and provide hardened interfaces as the only way to access their functionality. This approach reduces side effects and allows services to evolve at their own pace without impacting the other components of the overall system. Service-oriented architecture — or SOA — is the fundamental building abstraction for Amazon technologies.